A chandelier should provide a flattering look to your room and your table (or other setting). You need to consider both the size (height) of the chandelier and the size of the table or entry hall. There are different height recommendations for dining room chandeliers than for chandeliers in an entry hall. 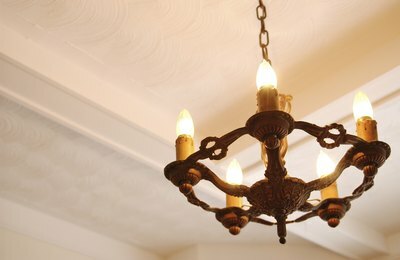 An entry chandelier should allow for at least 6.5 feet from the floor to the bottom of the chandelier; decoratingstudio.com recommends 7 feet from the floor to prevent a tall person from bumping into the chandelier. If you have an extremely high ceiling, you can hang the chandelier 7.5 feet from the floor. The height of the chandelier itself corresponds to about 2.5 to 3 inches for each foot of the ceiling height. For example, if your ceiling is 10 feet high, you should limit your chandelier height to about 25 to 30 inches. Hang the chandelier in the center of the room. Hang your dining room chandelier between 30 and 34 inches from the tabletop for a standard 8-foot table. Hang the chandelier 3 inches higher for each additional foot of ceiling height. The chandelier should hang over the center of the table. If the table is rectangular or oval, the chandelier should be at least 12 inches narrower than the table itself. If you have a round or square table, the chandelier should be 18 inches smaller than the tabletop. Your chandelier should be no more than about half the width of the table. In simpler terms, if your table is 48 inches square, then your chandelier should be no more than 24 inches wide. If you have a rectangular table that is 50 inches wide, then your chandelier should be no more than 25 inches wide. Pick a chandelier that fits your style and the rest of your house. You probably don’t want to mix ultramodern with an Early American style. Consider adding a dimming switch to your chandelier for ease of turning the lights on and off. Lampsplus.com also suggests using a low wattage bulb. Better Homes and Gardens offers a handy online calculator to help you determine your dining room chandelier height. You simply enter the width and length (in inches) of the dining room space, and click “calculate.” Based upon your input, you will be provided with a figure that includes the recommended maximum diameter of the chandelier.